ColorFabb announces today that it will start producing 3D Printing materials in pellet form. This new product is aimed at the DIY filament producers who own a small DIY filament extruder such as a filabot. 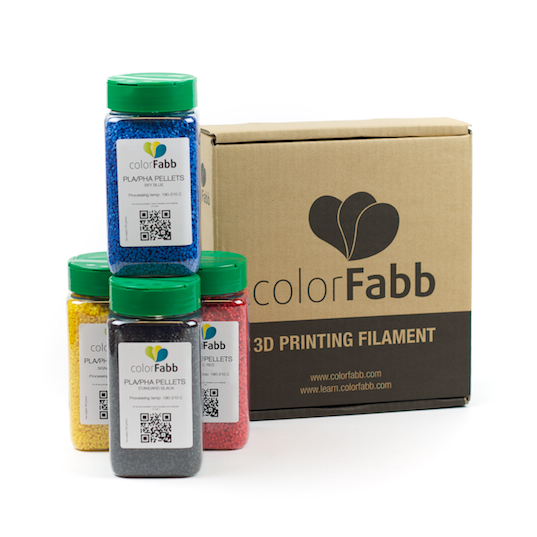 ColorFabb is offering customers so called test pack, each of them contains 4 jars of pellets, and you can select any desired color combination. A pack fits 4 jars which adds up to a total of 1.2kg of pellets. "We have invested a lot of time and attention to make this an attractive and configurable box, so that the user can select several varieties of 3D printing materials to get started!" said colorFabb CEO Ruud Rouleaux. While a spool of PLA / PHA (750 grams) costs €35.95, a test pack of PLA/PHA pellets (1.2kg) cost only €25. ColorFabb also offers woodFill pellets pack for €20, which is very attractive price compared to the €39.95 / 600 grams woodFill filament.